All requests from city officials for voluntary annexation of Commission right of way and other Commission-owned property should be submitted to the respective district office. The request must include a statement from the city officials verifying all adjacent property owners, the county where the area to be annexed is located, and all cities within a five-mile radius of the area to be annexed have been notified of the pending annexation and their reaction to that notice. Form RW39 is accessible in eAgreements. If, in the opinion of the district engineer, the request documents contain no evidence of significant controversy and the annexation would not be detrimental to the transportation system or the Commission, the district engineer is authorized to approve the request and execute the related Petition for Voluntary Annexation. Further, the district engineer may deny requests for voluntary annexation when, in his/her opinion, such denial is warranted. Petitions for Voluntary Annexations will not require approval as to form by the Chief Counsel’s office or attestation of the Secretary of the Commission. 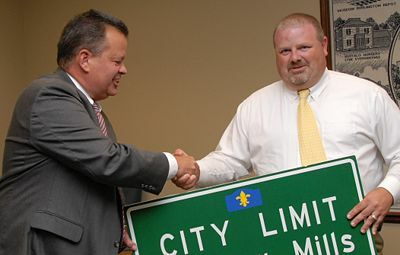 In all cases where the Petition for Involuntary Annexation is filed against the Commission or MoDOT, the Chief Counsel’s office shall make its entry of appearance in the case and take a non-adversarial position unless justification exists for opposing the involuntary annexation, in which case the Chief Counsel’s office shall enter an appropriate defense. A checklist for request of annexations is available. Additional information concerning annexation procedures, hearings, exceptions and objections is contained in RSMo Chapter 71, Sections 71.012, 71.014 and 71.015. The Annexation Process was approved by the Missouri Highway and Transportation Commission on February 7, 2006. It was later revised on March 30, 2007. Copy of Voluntary Annexation Petition (RW39). Form RW39 is accessible in eAgreements. The Commission will participate in voluntary annexation requests when it is found to be in the best interest of the MHTC, MoDOT and the taxpayers of Missouri. The Commission hereby delegates the authority of determining its participation in voluntary annexations to the district engineers responsible for the MoDOT operations within which the subject property to be annexed is located. The city will personally contact all adjoining property owners regarding the proposed annexation of Commission-owned property. Proof the city has placed a notice of annexation in the local newspaper for two consecutive weeks to obtain public input regarding the proposed annexation. If the city has no local newspaper, it shall advertise by whatever means it typically uses to notify citizens of similar type actions, and provide proof of such advertising. A letter from the city stating the expressed purpose of the annexation and that no controversy/objection was expressed regarding the proposed annexation. If controversy/objection regarding the proposed annexation is expressed, the letter will state the specifics of such controversy/objection. The letter will also include a statement that all adjoining property owners have been contacted. A letter from the county in which the city is located stating the county has no objection and no knowledge of any controversy/objection regarding the proposed annexation. If the county has knowledge of any controversy/objection regarding the proposed annexation, the letter will state the specifics of such controversy/objection. Letters from all cities within a five-mile radius of the property to be annexed stating the respective city has no objection and no knowledge of any controversy/objection regarding the proposed annexation. If the respective city has knowledge of any controversy/objection regarding the proposed annexation, the letter will state the specifics of such controversy/objection. MHTC plan sheets showing the existing and proposed city limits. City map or plat book pages showing the existing and proposed city limits. A copy of the legal description subject to inclusion in the Voluntary Annexation Petition (RW39). Form RW39 is accessible in eAgreements. if voluntary annexation is found to be in the best interest of or would not significantly impact the MHTC, MoDOT and the taxpayers of Missouri. If the city elects not to comply with the requirements of the Commission or the district engineer determines that the Commission will not participate in voluntary annexation, the district engineer or his/her designee will advise the city that the Commission will assume a neutral position with regard to an involuntary annexation action. If, however, the district engineer determines that the Commission should oppose an involuntary annexation action, the district engineer will so advise the chief counsel’s office and the city. Whether the Commission assumes a neutral position or opposes the involuntary annexation, the chief counsel’s office shall file an answer to the service of an involuntary annexation action. Copy of the Voluntary Annexation Petition (RW39). Form RW39 is accessible in eAgreements. (Any deviation from the approved Voluntary Annexation Petition form will require CCO approval as to form). Proof the city has placed a notice of annexation in the local newspaper for two consecutive weeks to obtain public input regarding the proposed annexation. If the city has no local newspaper, it shall advertise by using whatever means it typically uses to notify citizens of similar type actions, and provide proof of such advertising. Once the city submits all the required information, the voluntary annexation request will be placed on the Realty Asset Services Committee’s agenda. Committee members required to review voluntary annexation requests include: the right of way manager, construction and materials engineer, traffic engineer or appropriate traffic personnel, area engineer, project development engineer, planning coordinator and utilities engineer. The committee members will review the submitted information and make a recommendation to the district engineer regarding whether or not the Commission should proceed with the voluntary annexation. If the district engineer concurs with a recommendation to proceed with voluntary annexation, the right of way manager will prepare the voluntary annexation petition for the district engineer’s execution. The relevant MHTC plan sheets are to be attached to the Voluntary Annexation Petition (Form RW39). The district right of way manager may prepare a legal description to be included within the voluntary annexation petition, if the city makes such a request. The legal description is to be prepared from the latest plan sheets and not from a legal survey. If the city elects to prepare the legal description, the right of way manager will review such legal description for accuracy prior to the execution of the Voluntary Annexation Petition by the district engineer. Once the district engineer executes the Voluntary Annexation Petition, the right of way manager will forward the executed petition, with the relevant MHTC plan sheets attached, to the city for execution. After the city conducts the appropriate hearing and files the Ordinance for Annexation, it will provide a copy of the filed Ordinance for Annexation to the right of way manager, along with a copy of the executed Voluntary Annexation Petition. The right of way manager will verify that the legal description on both the Voluntary Annexation Petition and the Ordinance for Annexation describe the same area. If any discrepancies are found, the right of way manager will coordinate with the city to resolve the discrepancies. The right of way manager will forward a copy of the Ordinance for Annexation and the executed Voluntary Annexation Petition, with the relevant MHTC plan sheets, to the transportation planning director and the district traffic engineer. The transportation planning director will update the appropriate maps to show the new city limits of the subject city, and the district traffic engineer will relocate the city limit signs. If the district elects not to proceed with the voluntary annexation, the right of way manager will notify the chief counsel’s office and the city of such decision. Upon the Commission secretary’s receipt of service for an involuntary annexation action, the chief counsel’s office will file an answer to the service. Once the involuntary annexation action is closed, the chief counsel’s office will forward the Ordinance for Annexation to the district’s right of way manager. The right of way manager will forward a copy of the Ordinance for Annexation to the transportation planning director and the district traffic engineer. The transportation planning director will update the appropriate maps showing the new city limits of the subject City and the district traffic engineer will relocate the city limit signs. This page was last modified on 11 August 2017, at 13:52.